Ubisoft’s 2018 game Starlink: Battle for Atlas gives players a choice between purchasing physical toy spaceships, pilots and weapons to use in-game or paying substantially less for purely digital versions. It looks like the digital version won, as Ubisoft announced today there will be no more physical toys created for the game. While there are more pilots, spaceships and weapons coming to Starlink in this months’ spring update, they’ll all be strictly digital. In a production update posted yesterday on the game’s official website, the development team said that slow sales led to the decision to halt toy production. 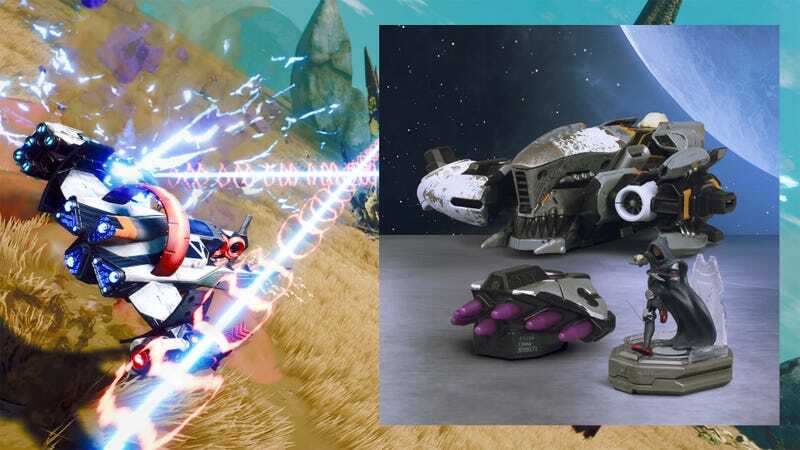 Starlink’s toys and the technology used to manifest them in-game are very cool. Players connect a plastic mount to their game controller. They slot a pilot figure onto the mount and place a spaceship atop the pilot. From there, players can add a combination of wings (up to three on each side) and weapons, creating a custom ship with a unique loadout that instantly appears in the game universe. The ship the player snaps together in real life is the one they see and control in the game. Remove a wing from the toy, swap it with another, and that change happens at the same time in the game. It’s a nifty gimmick, but an expensive one. At launch, spaceships packaged with a pilot and a weapon retailed for $25. Collecting an entire set of toys along with the game’s starter pack cost around $280. The digital deluxe version of the game gives players instant access to every ship, pilot and weapon in the game for only $80. It’s no wonder the toys didn’t sell well. It’s another nail in the coffin for toys-to-life. Genre progenitor Skylanders has been quiet since 2017, save the odd toy-less mobile release. Disney Infinity is no more. Lego Dimensions had a great run but called it quits. And now Starlink toys are discontinued. Fortunately, thanks to Ubisoft’s decision not to require toys to play, the game can continue to get new content in digital form. Along with new ships, pilots and weapons, the Starlink team says there will be new missions, activities and challenges coming to the game in the near future. Starlink toys are dead. Long live Starlink.